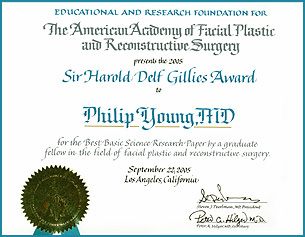 Awarded for Best Basic Science Research Fellowship Paper granted by the American Academy of Facial Plastic and Reconstructive Surgery. Award for outstanding academic achievement for top two students in medical school class. Awarded to top student of Chinese descent for second year of medical school. (NIH) National Institutes of Health Scholarship Award to do research on the algae Acetabularia acetabulum at the University of Washington.